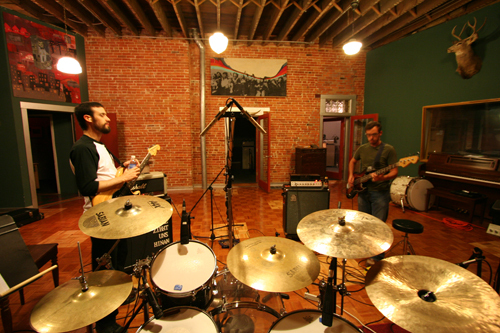 Coalesce » Coalesce initial Recording session completed. Coalesce initial Recording session completed. So we holed up in black lodge studios last week to start tracking on our new record. Five days of crash and bang and we’re now 15 songs deep. We’re happy with the first round, but we’re far from finished. Whiskey and westerns inspired; harsh and fast happened. (that’s what she said…) We feel like we’ve caught some great moments so far, and, if we’re lucky, we’ll catch a few more before it’s all over. We don’t expect to have anything up and ready for listening until late fall, but we’ll keep you all updated as things progress. What are you all up to?